Screenshot of the Masking function in use on the OSCOR Green. Here we can see a list of suspect signals in the middle with detailed information providing a better understanding of unusual signals in the area. When extended capture and analysis of RF traffic is required, it can be tedious to analyze large volumes of resulting data. 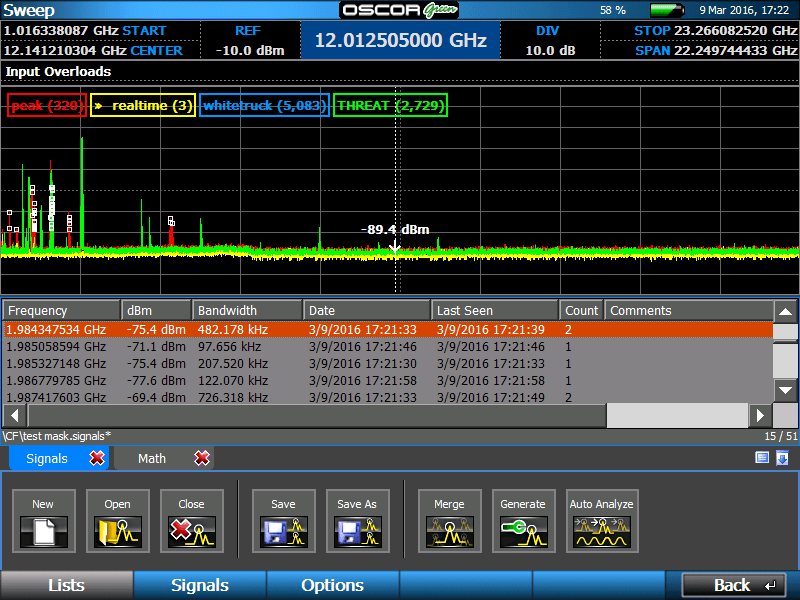 The Spectrogram Waterfall function on the OSCOR is an effective tool for visually inspecting RF energy over time. However, the Masking function may be an alternative starting point to help perform signal data analysis more efficiently. A Mask compares the active trace to a stored mask trace file and displays any signals exceeding the user-defined threshold. If a signal appears above the threshold, then an event is added to the signal list. The Masking function works by comparing a base reference trace file against a target location trace filtering out any normal signals. For example, the OSCOR Green can be left to capture data overnight when no one is present at the location. Typically, to analyze data captured overnight, visual inspection of the Spectrogram waterfall is required. With the Masking function, any new signals occurring above the threshold set by the peak trace file will appear in list format. 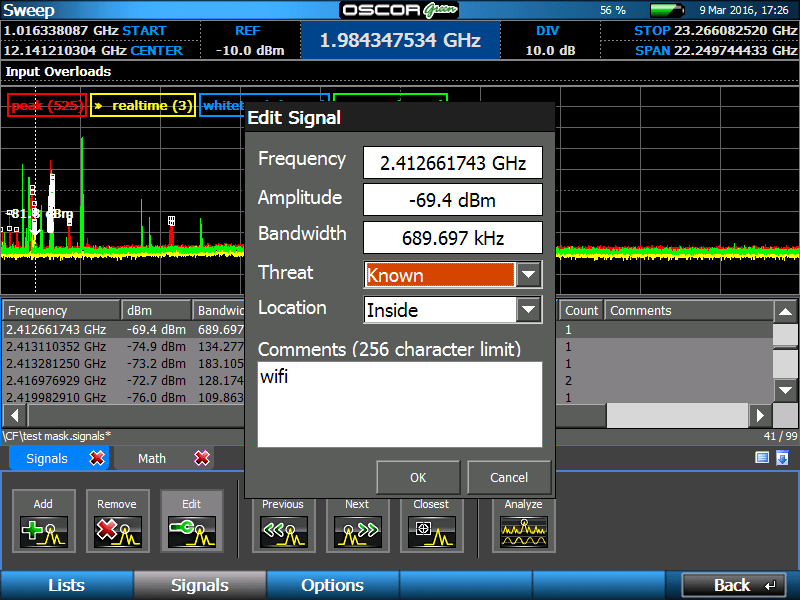 This is also useful when performing RF analysis on a regular basis. By using a base reference trace file from a previous scan, any new signals can be quickly identified. A list is created by the Masking function providing detailed signal information that can be helpful in determining possible threats. The signal list table includes frequency, power, bandwidth, timestamp, last seen timestamp and count information. The ‘Date’ column shows when the signal first appeared, and the ‘Last Seen’ shows the last time the signal was captured with the ‘Count’ column displaying the number of times between the timestamps the signal was visible. This combined information may provide a better overall understanding of any unusual signals before analyzing the data with tools like the Spectrogram Waterfall. In addition, teams should have a clear idea when the signal will reappear, allowing them to focus their efforts. By displaying a simple list of signals with detailed information, security professionals can better manage their time onsite and focus on suspect signals more effectively. REI’s Training Center offers RF specific training courses.